Made in England using quality ingredients, Blick Studio Oils offer great performance at an affordable Blick price. They're ideal for artists of all levels — students and beginners just learning to paint, advanced artists who want to experiment, and professionals seeking large volumes of color on a limited budget. 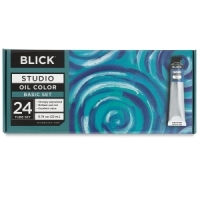 Available in a broad range of 50 colors, Blick Studio Oils are strongly pigmented, brilliant, and rich. They have a buttery consistency that allows for application with either a brush or knife, and their covering power is excellent. 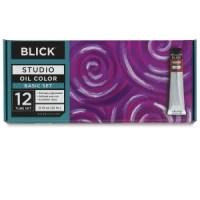 Stroke for stroke, Blick Studio Oils are one of the best student-grade paints you'll find, and they're backed by our 100% satisfaction guarantee. Basic Set of 12 — An excellent choice for beginners, this set contains 22 ml (0.74 oz) tubes of Titanium White, Ivory Black, Crimson Alizarin, Cadmium Red Hue, Yellow Ochre, Lemon Yellow, Cadmium Yellow Hue, Ultramarine Blue, Cerulean Blue Hue, Sap Green, Burnt Sienna, and Burnt Umber. Intro Set of 6 — Containing six of our most popular colors, this set includes 22 ml (0.74 oz) tubes of Titanium White, Cadmium Yellow Hue, Cadmium Red Hue, Ultramarine Blue, Viridian Hue, and Burnt Umber. Basic Set of 24 — Experience a wide variety of brilliant colors with this set. It contains 22 ml (0.74 oz) tubes of Titanium White, Ivory Black, Crimson Alizarin, Cadmium Red Hue, Yellow Ochre, Lemon Yellow, Cadmium Yellow Hue, Ultramarine Blue, Cerulean Blue Hue, Sap Green, Burnt Sienna, Burnt Umber, Zinc White, Buff Titanium, Cadmium Yellow Pale Hue, Cadmium Orange Hue, Dioxazine Purple, Permanent Light Green, Raw Sienna, Raw Umber, Primary Magenta, Light Blue, Emerald Green, and Primary Yellow. Starter Set of 10 — Great for mixing, this set includes larger, 38 ml (1.28 oz) tubes of Titanium White, Lemon Yellow, Cadmium Red Hue, Ultramarine Blue, Viridian Hue, Crimson Alizarin, Yellow Ochre, Burnt Sienna, Raw Umber, and Ivory Black. 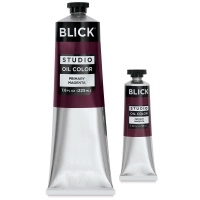 To view a PDF of Blick Studio Oil Paints, please click here.